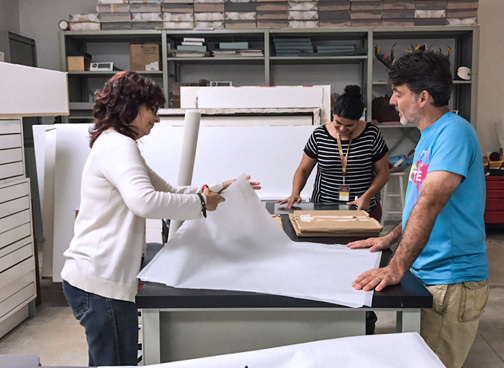 Norma Vila (in the background), registrar of Sacred Heart University, MAPR's registrar assistant, Marnie Pérez and preparer Carlos Faure, complete the process of entry of several of their works. Norma Vila (in the background), registrar of Sacred Heart University, MAPR’s registrar assistant, Marnie Pérez and preparer Carlos Faure, complete the process of entry of several of their works. The Puerto Rico Museum of Art, (MAPR as it is known for its initials in Spanish) is spearheading efforts to rescuing and preserving the island’s cultural heritage in the wake of the emergency Hurricane María has caused. The institution is working with help from the Smithsonian Institution, an organization with which it is affiliated, and from which it received a $75,000 grant. In addition to preserving its collection, MAPR has become a temporary repository for institutions that need to provide a safe environment for their collections. Currently, the MAPR stores objects that belong to collections from the University of Puerto Rico and Sacred Heart University, while it works with the Caguas Museum of Art and La Fortaleza, the governor’s mansion, to admit their works of art into its building. “Two days after the hurricane, when we first had access to phone lines and other ways of communication, we continued to execute the emergency plan. The devastation left by the hurricane made it clear that we would need help, so we began phase two of our plan, which consists largely of ensuring the stability of the collection,” said Marta Mabel Pérez, acting executive director of MAPR. “It was when we started communicating with the Smithsonian Institution that, thanks to our affiliation, they were able to process the aid in record time. For this achievement, we thank the past director of MAPR, Lourdes Ramos, who has been present in the process even from a distance,” she added. The Smithsonian Institution’s $75,000 grant will be used to purchase diesel to keep the MAPR’s power generator operating and to provide training to art conservation professionals to work with the collections that were affected. “Galleries and storage areas are being monitored twice a day to ensure proper temperature and humidity levels. It is of utmost importance for us to meet the needs of our museum and arts and culture community,” said Arturo García-Solá, chairman of MAPR’s Board of Trustees. “The MAPR remains closed to the general public, while this emergency is being attended to, so as to facilitate this work of rescuing the cultural heritage now, so necessary and vital,” he said. “The Museum suffered damages that initially appeared to be minimal, but, over time, without electricity service, they have started to escalate and we are working toward that mitigation, for which we will need the help of all,” he said. “However, now, the main thing is to ensure the collections, those of our community of institutions as well as ours. These are treasures of Puerto Rico, irreplaceable and invaluable, that have to transcend our generation and remain for those who will come in the future,” said García-Solá. MAPR is also working with FEMA’s Heritage Emergency National Task Force (HENTF) to continue extending aid to institutions that need it. Study: Retailers could lose $8.4B if power is out 6 mos. Hey Buddy!, I found this information for you: "MAPR acts as repository for PR cultural, art collections". Here is the website link: https://newsismybusiness.com/repository-cultural-collections/. Thank you.